• Best Week Since March. U.S. stocks climbed higher Friday, capping the week with solid gains as consumer staples rallied to a six-week high, offsetting concerns after President Trump criticized the trading practices of Canada and France ahead of the G-7 Summit. • Two Indices Reach Record Highs. For the week, the S&P 500 gained 1.66%, the Dow Industrials advanced 2.77%, and the tech-heavy Nasdaq Composite rose 1.22%. Earlier in the week the Nasdaq Composite and the small cap-focused Russell 2000 each posted back-to-back new all-time highs. • Telecom Companies Rebound. Ten of the 11 major sectors posted gains last week, led by Telecom (+3.36%), Consumer Discretionary (+3.21%) and Materials (+3.04%). Technology (+0.70%) rose the least, while Utilities (-3.02%) lagged. Consumer Staples rose 2.43% last week. • Treasurys Prices Ease. The U.S. Dollar Index slipped 0.66% last week, ending at 93.535, while Treasury prices fell, sending the yield on 10-year notes up 4.4 basis points at 2.947%. West Texas Intermediate oil was little changed last week, down less than a dime and ending the week at $65.74/barrel. 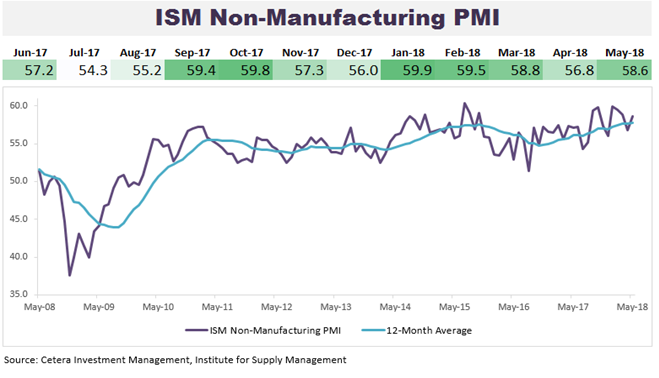 The ISM Non-Manufacturing Purchasing Manager’s Index (PMI), which measures services activity in the U.S., climbed from 56.8 in April to 58.6 in May. A reading above 50 signals expansion. May's reading was higher than 91% of all readings over the last 20 years. Moreover, the 12-month average reached its highest level since 2006 and this economic indicator has expanded for 100 straight months. The ISM Manufacturing PMI also gained in May. The combination of strong readings for the ISM Manufacturing and Non-Manufacturing PMI's is a signal that GDP growth is likely to rebound in Q2 following a slowdown in growth in the first quarter. The ISM Non-Manufacturing PMI is an important economic indicator because services accounts for roughly 70% of economic activity in the U.S. There were a few concerns listed in the ISM survey from industry leaders, namely tariffs and their potentially negative impact on growth going forward. Despite these concerns, the ISM Non-Manufacturing New Orders Index, a proxy for future growth in services activity, increased to a three-month high in May.